It just hit me that almost exactly two years ago today, I was exploring the Folsom lake bed, and I wasn’t in scuba gear. The water levels were so low, what was once a vast lake was reduced to a large puddle. It was at that moment that I truly appreciated how dire the water supply situation had gotten here in California. It was one thing to read and hear about it and another thing to see it in person. I often contemplated through the following year, if we did not get some serious rain for another year, we would experience a catastrophe the likes of which we have never seen before. Fortunately for us the drought finally started to let up that year. This year we are seeing record rains, but more importantly, corresponding snow packs. 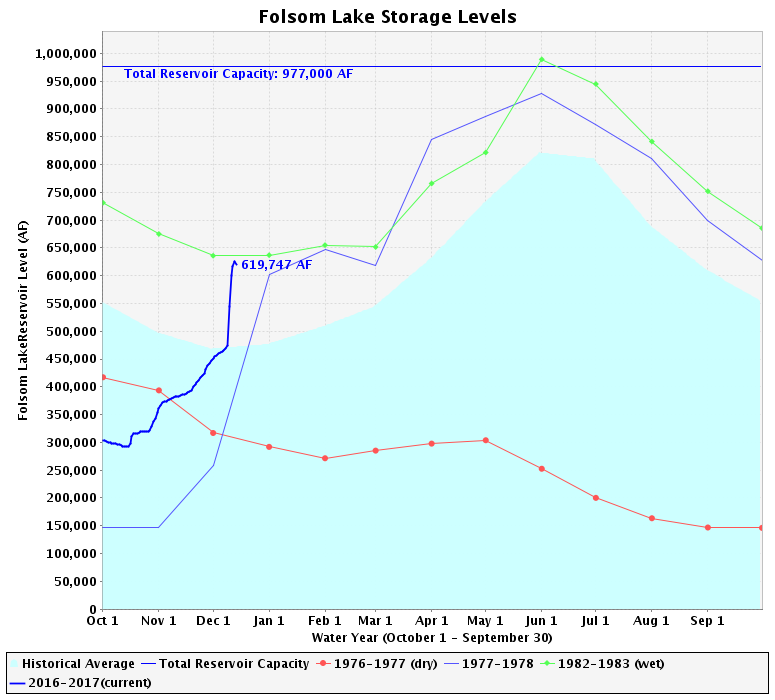 The chart to the left is courtesy of the fine folks at the California Department of Water Resources Data Exchange Center. It has been raining heavily all day today and most of this week, yet most folks now just seem to be very grateful overall, myself included. It is yet another one of the many journeys my photography has taken me on. 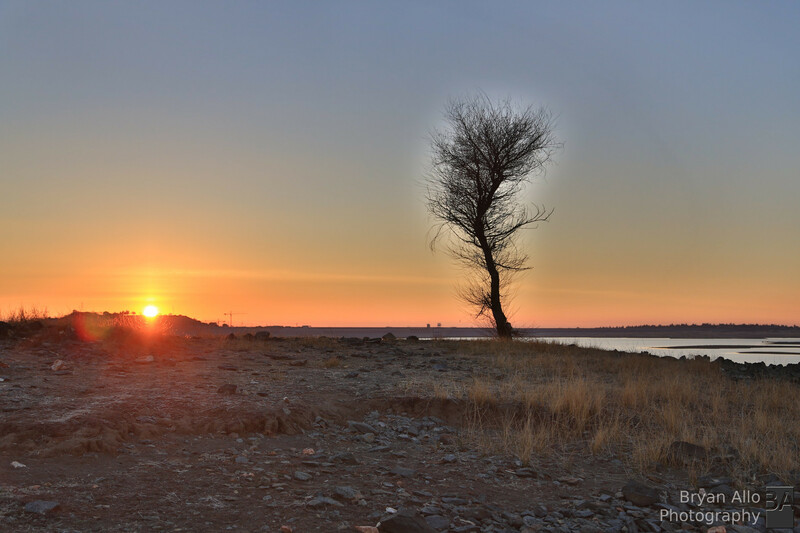 Folsom Lake at one of it’s lowest levels. For several years now California has been experiencing a severe drought. So severe that earlier this year the Governor as well as state agencies implemented various water conservation measures. The citizens also stepped forward to help alleviate the grave water shortage. I like many just stopped watering my landscape and let it die out. I eventually removed the lawn on my quarter acre property because honestly it did not make any sense whatsoever. It also slashed my water bill in half which means more resources for photography! Yay! …LOL. Like many, I didn’t fully grasp the gravity of the water shortage we are facing until I took a hike to the bottom of the Folsom lake reservoir with my good friend and fellow photo geek, Sasha January of this year. It was a eye opening excursion. I was blown away by the fact that I could take a leisurely stroll on the lake bed where several years ago I was boating with friends and enjoying summer on the lake. The water level dropped so low we were able to explore old gold mining settlements and ponder a piece of this great state’s history. Finally this winter we have been getting rain most days of the week with little sunny breaks on the weekends. We are still far from where we need to be (as far as rainfall) to get out of the drought, but we are most grateful. I thought now would be a great time to look back in retrospect and post about it. See the California Drought page for updates. I also found this Insightful NASA Report. Below are some choice shots from that excursion.